The webpage outlines a pattern for employing “Service Oriented Architecture”, to loosely couple the components within a RIA (Rich Internet Application). This coupling allows the ‘loosely coupled’ components to collaborate or communicate with each other. In such typical application (Fig#1): (a) each ‘loosely coupled’ component may offer one or more services for other components, and/or (b) each ‘loosely coupled’ component may consume one or more services of other components. Few components may neither provide nor consume services. Such components may be considered ‘loosely coupled’ components, having zero real dependency or coupling with other components. The above FIG-2 shows, how a global registration object (e.g. A Directory) may be used to facilitate communication between any two components (where one is service provider component and the another is service consumer component). Lets see how this can be implemented in the RIA (e.g. webpage). A sample implementation of class definition for ‘Registration Object’ is given in Listing#1 (Please review complete but simple implementation below - just 15 line of actual code). // This function registers or Adds a service and its name. // This function searches for name of service "ser_name"
This class implementation uses two arrays 'service_func' and 'service_name' to store the reference of the service-functions and the service-names respectively. Service-provider components use 'AddService' method to register their services. This method appends service-function and service-name to respective arrays (at same index-location). Service-consumer components use 'FindService' method to lookup each service. This method looks up 'service_name' array for the name-string. If the name is found, it returns reference of the service-function stored at corresponding index-location (e.g. indx) in 'service_func' array. Here, Chief Designer/Architect can make a variable (e.g. ‘RegistrationObject’) a Reserved Global variable for the application. 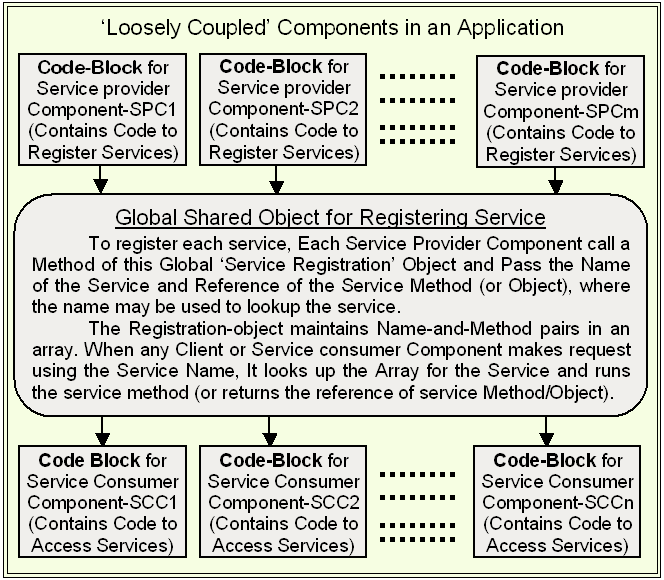 Then the developer of each service-provider component implements the code, so that the component register its services with the global registration object (by using a predetermined service name). For example, the component's code-block may include the following one line to register a service function. The above SoA pattern may be used in a RIA to create communication code between any two 'loosely coupled' components, such as Mashups (or between patent pending 'Interchangeable Components', which are presented below & in this website). Copy Right © 2013 SPPS Systems Pvt.Ltd. All Rights Reserved.